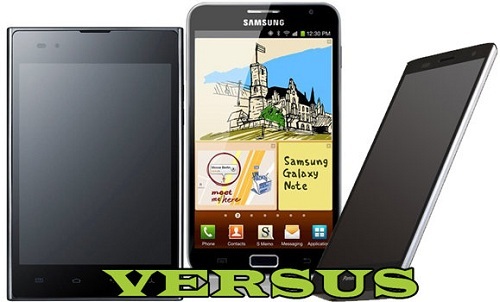 Samsung Galaxy Note was the first device that was aimed to fill the gap between the phone and tablet but 5inch display to some people might seem too big but to some people it might just be the right size. One thing you can be sure about that 5inches doesn’t make for a very compact device but if you are looking for a device that can fulfill your both tablet and phone needs then owning a 5inch tablet/phone will be the best thing to do. After Samsung released their 5inch pahblet LG and Panasonic also took first steps in releasing their own 5inch hybrids which were first announced in MWC 2012. Samsung Galaxy Note was the first device of its kind with dimensions of 146.9 x 83 x 9.7 mm and weighing 178g. You also get a Super AMOLED Plus Screen with a HD resolution of 1280×800 which made the device very unique. The device has an all plastic body which helps to keep the weight down and additionally display is protected with cornering gorilla glass which makes it more durable. You also got a stylus which helped the device to stand apart and also made it popular among the graphic enthusiast because you could use the stylus to take notes or draw various design right on the screen. The S-Pen also responds to different screen pressure so you are able to draw exact shapes. LG Optimus VU has dimensions of 139.6 x 90.4 x 8.5 mm and weighs 168g. The display is IPS LCD with a resolution of 1024×768 which makes it bit inferior as compared to Note. Also you get an S-Pen which is dubbed Rubberdium but unlike in Galaxy Note then stylus cannot be tucked away in the device which makes it very likely to lose the stylus. Panasonic also made sure that the device is water and dust proof and in addition have added the superfast charging which is reported to charge the device to full in an hour. Samsung Galaxy Note comes with either 16/32Gb of internal storage which you can further expand to 32Gb via the microSD card slot. You also get 1GB of RAM which makes sure that any and all applications are able to run in the device smoothly. LG Optimus VU comes with 32Gb of internal memory which you can expand via microSD card up to 32Gb. Also you get 1GB of RAM. Panasonic Eluga loses in terms of internal storage to the other two because you only get 8Gb which you can expand to 32Gb by microSD card. Panasonic Eluga comes preinstalled with Android 4.0 ICS which is powered by dual core 1.5Ghz S4 snapdragon processor with Adreno 225 GPU. Well after the comparison you can see that Galaxy Note has good display and also performs better but it comes with preinstalled with Gingerbread but Samsung have promised Ice cream sandwich update for the device which should improve the performance considerably. As for LG Optimus VU it definitely provides a competition against Galaxy Note but if you want a good looking display then Galaxy Note would be the device. Panasonic have done their best to make their device stand out from the other two and they have succeeded. So do let us know what you think about the devices and which device you would prefer.